Best Java Classes in Pune offers customized Java training for Individual Students, Freshers & Working Professionals. Best Java Classes in Pune offers private customized onsite Java Fundamentals training & JAVA J2EE Advanced JAVA training in Pune Our private classes (corporate Training) are normally delivered at your offices, but can be delivered at a different location of your choice. We have a wide range of Java training courses to accommodate almost any training need. Whether you need to learn JSP training, Springs 3, Struts 2 training, or other courses, JAVA Training Institute has a course for you and your team members! 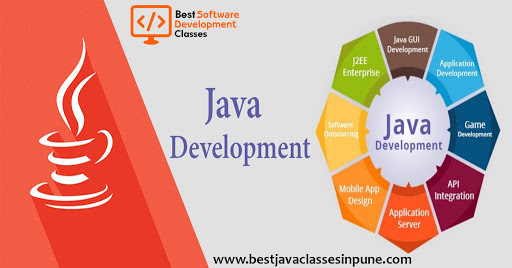 Best Java Classes in Pune is the only Place in Pune to offer in-depth training on all latest J2EE technologies & live project at reasonable price by well experienced real time consultants and an Opportunity to work on real time project for selected students. Best Java Classes in Pune,the Courses conducted by well experienced industry professional who has worked on multiple MNC projects. In depth, job oriented coverage on basic and all latest java technology frameworks including Struts 2, EJB, JMS, JSF, Hibernate, Springs 3, JDO, Web Services, AJAX & UML, Various design patterns/J2EE project. Work on WebSphere, Weblogic and JBOSS Web Servers. Walk through on Enterprise projects on the complete life cycle and code with Agile Methodology. JAVA J2EE projects for all Students which you can add in your resume with little modification or enhancement. If you’re a fresher holding BE or MCA or MTech degree (technical background) looking for a career in Java & J2EE technologies, you have come to the right place. Our Developers will teach you the in & out of Java basics and train you on all the advanced technologies. This course will prepare you for the OCJP, OCWCD exams (earlier known as SCJP,SCWCD). We take you through a live environment in which you get to work on projects according to your skill set. Regular and Fast-Track batches which empower you to find a job quickly and easily. We guarantee you an edge over others in just a matter of Time. We are the Best Java Classes in Pune. We welcome you to Best Java Classes in Pune Website. Here you can access world class JAVA Materails, Ask Questions, JAVA Syllabus in our website. Industry Delivered Practical Skills which are Internationally Accredited, to aspiring I.T. Career Professionals. Our Java Programming Courses feature Real Life Programming Briefs in Key Java SE and EE Environments, Best Practice Workshops and Practical Java Project based Interactive Training to achieve High Quality results for our course graduates on their Career path. Transferable Skills, Worldwide Centres in over 100 territorities and over 30 years of providing Training Excellence to the Java Programming and Information Technology Industry make these the definitive range of Java Programming Courses choice, enabling you to achieve success in your Programming Career. As Providers of the Most Comprehensive range of Java Programming Courses, Qualifications and Java Client Programming Briefs, Our Java Programming SE and EE Courses are the Definitive Answer to your Upskilling Requirements in this World Class Industry. To learn Core Java Programming you need to have an extensive programming background, the core programming let you know about the basic programming fundamentals and understanding of java in object-oriented programming. While learning core java programming, you will be able to learn the use java in API and GUI applications. So an advanced level course will build your skills to help you to learn the Java programming object oriented fundaments. We differentiate ourselves by involving professional technical consultants and trainers in the recruitment process like screening, assessing and interviewing candidates, hence delivering most precise and perfect match to your technical requirements.